It's a little thing, but once you've tried just laying your devices down at night to charge, you'll never want to go back to fiddling with cables! 1. 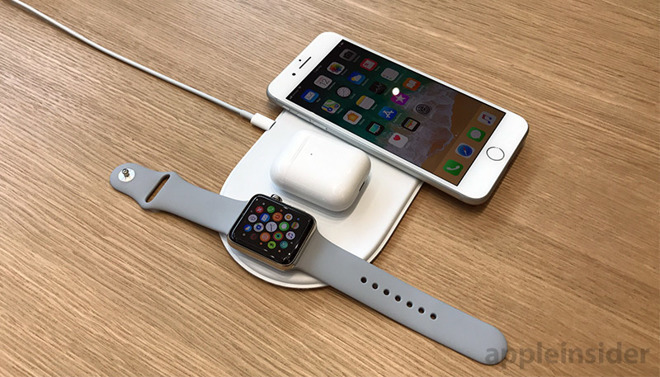 Allow an internal battery so we can use AirPower anywhere wirelessly. Then I will be interested in such device. Fascinating that it was announced in September 2017(?) and we're still waiting. I'm using a Belkin Boost Up which charges my watch and phone simultaneously. If Apple ever releases a wireless AirPods case, I'd consider AirPower, except, I use Apple's stainless steel watchband with a butterfly clasp, so there is no way to lay it flat on the pad without taking off the band. The Boost Up has a USB port where you could probably plug in a small Qi pad for the air pods. I'd be more likely to take that route. Don't even want it any more. A stand is way better than a pad. I can leave my iPhone screen on and watch video while it charges. I bet you can buy a stand for every one of your wireless charging devices for less money than this pad will cost. Disagree. When I travel I want to bring one cable, one mat, and toss my daily devices onto it when I go to sleep, then grab and it go when I leave the room for the day. At home I could even set it up somewhere (kitchen or foyer next to the keys) and toss stuff on it when I get home. Plugging in "stands" doesnt fit the use cases of mats. Does it not bother you that it needs to be on there just right? That's why I'm so excited and hopeful about AirPower. I don't want to have to worry at night that my phone got knocked off the specific charging area and the alarm won't go off.